Gabriel grew up in fear of his abusive father. As a teenager, his father is no longer with him but the effects of his abuse are clear. Gabriel refuses to sit by and watch other kids get away with bullying their classmates as his dad bullied him; he's willing to stand up for himself and other kids. As a freshman in high school, this attitude gets the attention of the school's principal who recommends Gabriel be transferred to Prince of Wales Boarding School, a prestigious high school with a reputation for turning kids into successful gentlemen. But when Gabriel arrives at the school, commonly referred to as "Patch," he quickly realizes things are not what they seem behind closed doors. The school is run by prefects, a group of seniors who have been appointed by the principal to keep order in the school. They do this by threatening and abusing the rest of the students. The bullies at this school are in complete control, with the full support of the principal ~ until Gabriel arrives on campus. 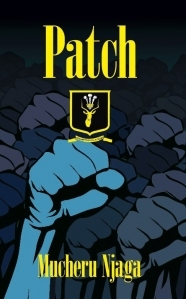 I don't generally read young adult novels, but when I heard about Patch by Mucheru Njaga, the story intrigued me. Bullying is a hot topic in the news these days, making this book quite timely in my opinion. I couldn't put it down. The story and the writing propelled the story forward from start to finish. The brutality of the prefects was horrifying but Gabriel's determination kept me going. The fact that this novel is loosely based on the author's own experiences at Prince of Wales Boarding School is very disturbing. Njaga evidently attended the school and moved up through the ranks of student leadership to eventually become one of the bullies. According to the press release about the book, after reading an article about a boy who committed suicide because he could not cope with a local school bully, Njaga was struck by the familiarity of the boy's struggle, and Patch was born. I highly recommend this book. There is quite a lot of violence and brutality in it, but I think the message is an extremely important one ~ and the story is interesting and engaging from the first page to the last. For more information or to read an excerpt from Patch, visit Mucheru Njaga's website. This review was written based on a copy of Patch that I received from Phenix & Phenix Literary Publicists in exchange for an honest review. I would love to read Patch :) *Thanks* for the giveaway! I follow your blog via GFC, Becky B.